The art of darkroom developing and printing will never go out of style. 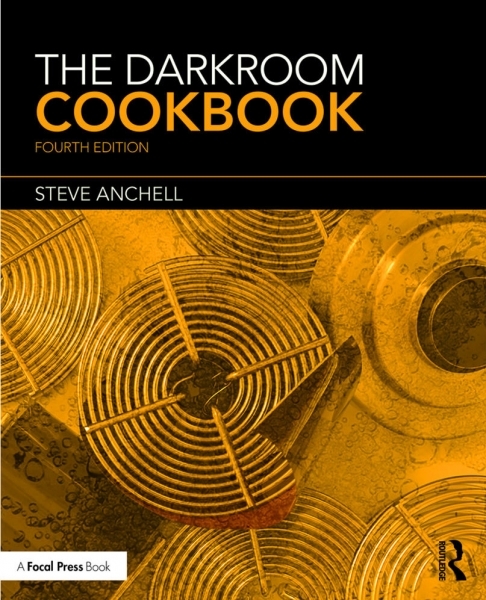 Master darkroom specialist Steve Anchell is back to prove it in this long-awaited third edition of his enormously successful Darkroom Cookbook. Packed with over 200 "recipes," some common and others rare gems, you'll discover something else every time you open this guide, whether you're a beginner to the darkroom or have been making your own prints for years. In addition to the formulas, you'll find tons of useful information on developers, push-processing, where to get darkroom equipment, how to set up your own darkroom, how to work and play in your darkroom safely, and much more. This handy guide will become a constant companion for every darkroom enthusiast creating prints at home or in the studio. In addition to complete updates throughout to reflect changes in the availability of chemicals and equipment, this third edition contains all updated information on: Reversal processing, Enlarged negatives, Pyro formulas, Plus expanded sections on printing pyro and toning prints Also included for the first time are special technique contributions as well as stunning black and white imagery by Bruce Barnbaum, Rod Dresser, Jay Dusard, Patrick Gainer, Richard Garrod, Henry Gilpin, Gordon Hutchings, Sandy King, Les McLean, Said Nuseibeh, France Scully Osterman, Mark Osterman, Tim Rudman, Ryuijie, John Sexton, and John Wimberly. Be sure to visit darkroomcookbook (dot) com to find useful links, an interactive user forum, and more! Steve Anchell is a photographer and author of The Variable Contrast Printing Manual, and co-author of The Film Developing Cookbook. He has been teaching darkroom and photography workshops since 1979. Steve is a member of the Freestyle Advisory Board of Photographic Professionals. "With its unrivaled collection of photographic formulas and easy to understand explanations of photographic processes, The Darkroom Cookbook has long been a favorite with darkroom workers everywhere. Now, with further additions to its formulary, more topics, and contributions by renowned darkroom experts, this updated edition promises to be an indispensable Aladdin's Cave resource to darkroom enthusiasts of all levels." -Tim Rudman, photographer and author. Steve Anchell, Professional writer, lecturer, and internationally known photographer. He has been a contributing editor for several publications including Outdoor Photographer and Camera & Darkroom, and has written columns, feature articles, and interviews for View Camera, Shutterbug, and Rangefinder. Has served as editor for Focus magazine.